There's this beautiful line in a Bruce Cockburn song called "Pacing the Cage." It always makes me smile and breaks my heart at the same time, because for me, it's the essence of creating art, which is a continual giving, giving, giving, whether most people realize or appreciate it or pay attention or not. All the spells that I could sing. It's perfect for me, that verse, on two levels, because on one hand, I feel that some portion of my brain is always engaged with coming up with the next thing I want to share, something that will make you smile or gasp or feel good all over, knowing that there is this little corner of Ohio where all the things that should be happening in the turning wheel of the seasons are still happening. 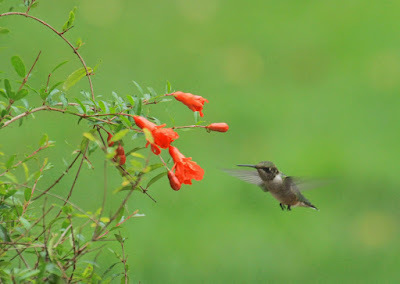 That there is this sanctum sanctorum where the ironweed bursts into bloom and is mobbed by swallowtails, where box turtles are laying eggs, some of which actually hatch, where newly-minted hummingbirds are dipping into dwarf pomegranate blossoms and there is someone there to witness it and bring it to you. And on the second level, that verse is perfect, because the gods or God of all that is beautiful and perfect is lobbing beautiful and perfect things at me faster than I can field them, faster than I can photograph them. I could sit at my drawing table all day long in late summer and shoot out the window and never, ever be bored for a moment. So maybe He never knew what all I wanted, so He gave me everything. Or She. Or It. Or Dod. Dod and Ida. I don't know who's behind this. I'm still trying to figure out why so much magic comes my way, every dang minute. I just know that it I am in a constant state of worshipful excitement about it, and grateful doesn't even begin to describe how it makes me feel. It takes me to an otherworldly plain. A star plain. That's it. I feel like I live on a star plain, right here on Earth. And I am thankful that I have the means to share it with so many people. 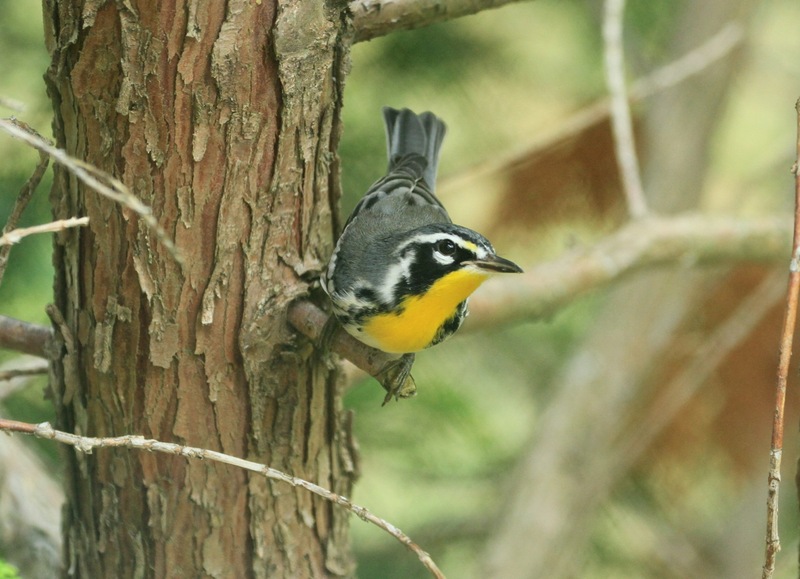 I am getting little waves of migrating yellow-throated warblers, several a day. 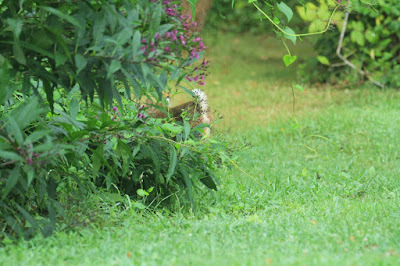 And every durn one of them stops to peek in my studio window at me. Today, this one was hovering right at eye level, again and again, as if it had come to call me to attention. I'm there! I'm there! I'm paying attention! I have several dozen photos of these exquisite birds from today alone. Dozens from the day before, and the day before, and they're all different birds. 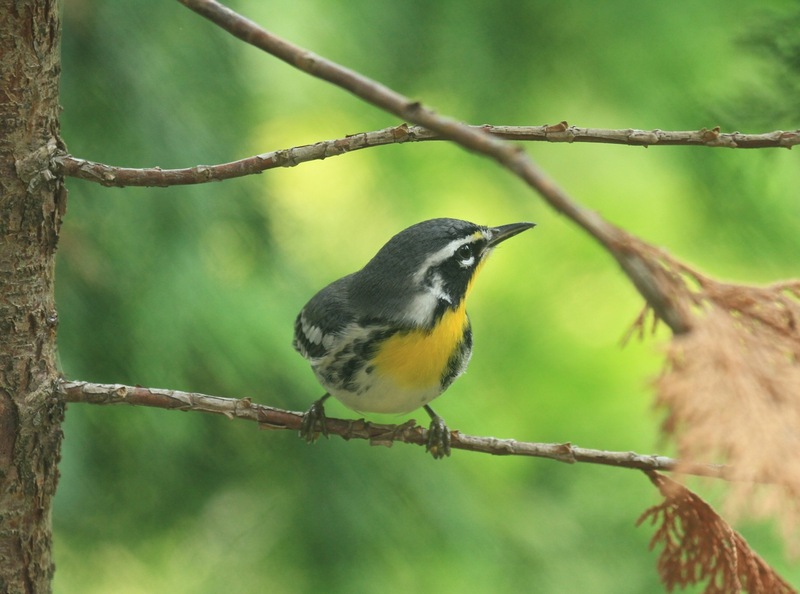 Yellow-throated warblers. Of all the things. And just inches away from my face, so close I have to back up to photograph them. I just shake my head. It's all so, so beautiful, and it's all as if it were being choreographed to bring me to an ecstatic state. I woke up this morning to this. 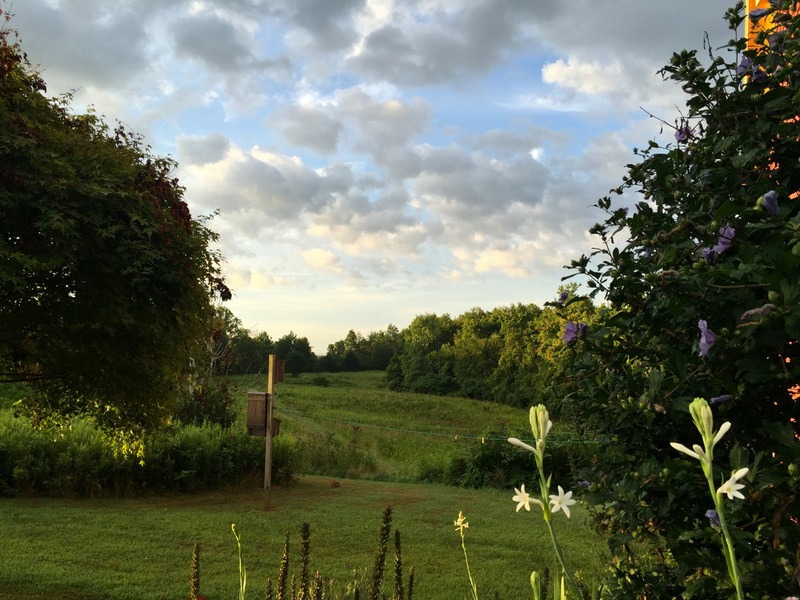 Tuberoses still exhaling their night perfume, Rose of Sharon rolling open, sheep-clouds trotting across a pearly sky, all of Nature singing, still dripping with the night's little showers. I knew it was going to be a wonderful day. Mostly because I get to be here, all day long, witnessing. I do not forget for one minute how lucky I am to be here. I did my morning routine, which is get up, let Bacon out for a wee, give him his blood pressure and thyroid pills in little sausage treat balls, then a liver bikket to top him off; feed the woodpeckers, finches and cardinals their peanuts and sunflower hearts on the deck; grab a small handful of koi sticks for the comets in the pond; walk around the house admiring the zinnias and purslane and gaillardia and crazily blooming roses; check the morning glories for buds; pull whatever weeds I missed yesterday, end up in the garage where I tote the black oil sunflower and thistle seed out to the studio feeders; check to see that the birdbaths are clean (scrub them with Comet and refill if not), and finally retire inside to open the laptop and see what's happened overnight. I opted not to run this morning because those little sheep-clouds closed in for a morning thundershower, what a delight! So I was at my drawing table when the Gang of Eight Squirrels appeared to chow down. This is a recent phenomenon. 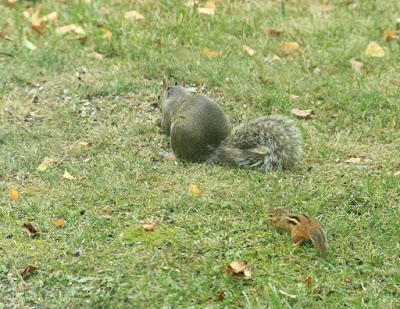 We never had a solitary squirrel in the yard until years after our neighbor Gary died. Gary had been eating them all. I mean, all. 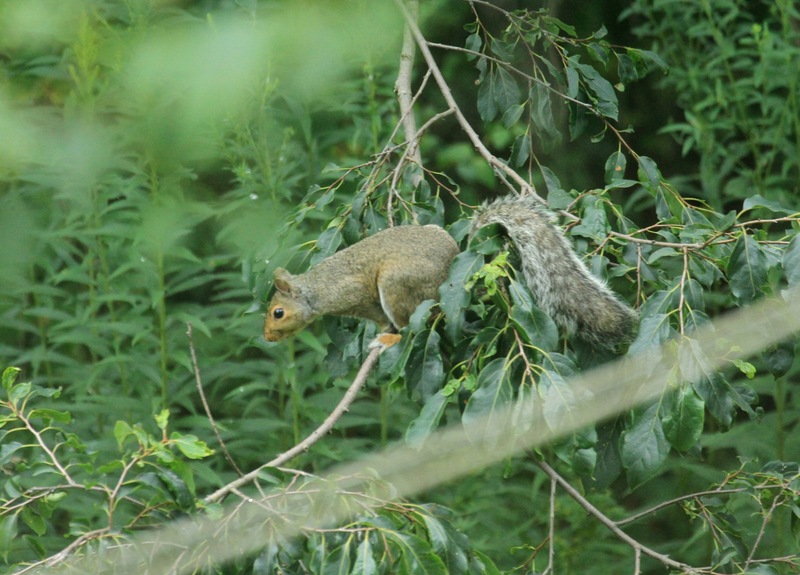 If you ever saw a squirrel, it was deep in the woods, and it would leap like a scalded ape from tree to tree to get away from you. They never came into the yard. Humans live in yards. They were terrified. All that has changed. 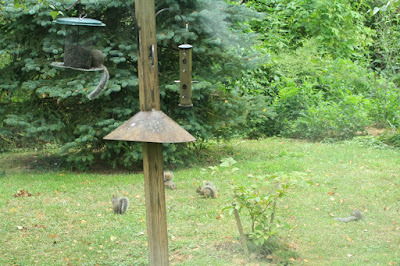 These squirrels have grown up for probably ten squirrel generations, eating sunflower seed at Casa Zick/Thompson. I am appalled at their numbers, but the most I can do is send Baker out to rout them every couple of hours to give the birds a chance. I broadcast seed all over the yard so the birds can get some, too. 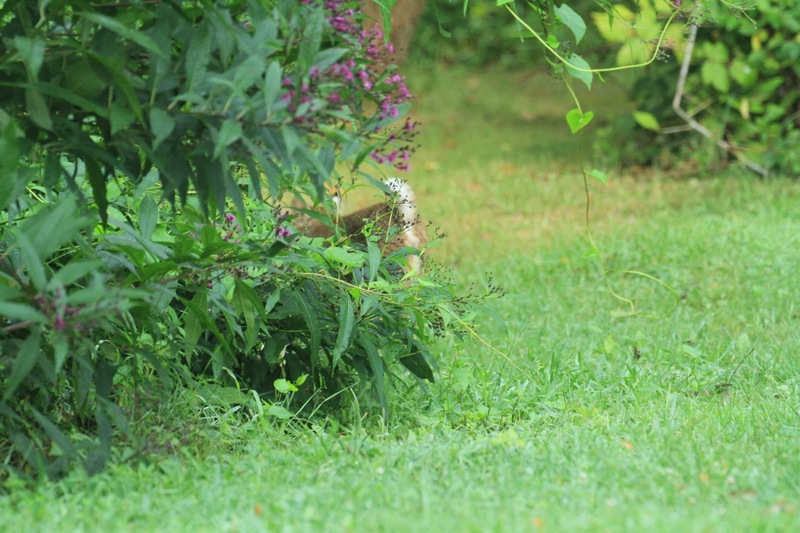 Then I throw some sunflower hearts for my brown thrasher, who otherwise laboriously pounds the black oil seeds open one by one, and we don't want him to have to do that. Everybody eats. I had found an interesting splash of mourning dove feathers near the spruce a couple of days ago, and it didn't look like the big young Cooper's hawk's work. It looked different. Like something had grabbed that dove and not stopped to subdue it or pluck it the way a hawk would. Just grabbed it and carried it off. I puzzled over that. I'd seen a black and white housecat slink through about three weeks ago, and I wondered if it was still lurking around doing its dirty work. No housecats allowed here. I'm doing my combo of working a little bit and staring out the window a lot. It's around 7:33 AM, August 15, 2016. All of a sudden this spaniel-sized medium-brown BLUR races into my peripheral vision, flowing in one huge lunge up the trunk of a birch tree right behind the Bird Spa. 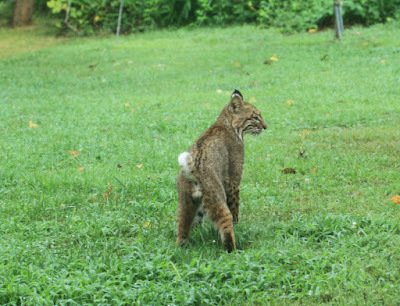 OMGGGGGGG that had to be a BOBCAT!! It's hot on the tail of a fat squirrel which practically turns itself inside out spiralling up that trunk, then leaping wildly out of the crown of the tree to flump! to the ground and skibble to the safety of the nearby woods. I leap up just as quickly and start flailing around for my big camera, which turns out, after several darting sallies, to be PLUGGED INTO MY LAPTOP by its downloading cord. I.E, it's right at hand. OK. Stop panicking!! I seize the camera and yank it, cord and all, away from the laptop, like I'm pulling out a bindweed vine. 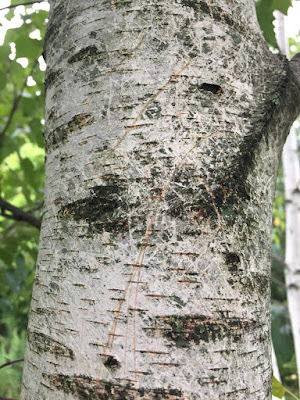 By this time the cat has lunged back down the birch trunk and run into the backyard. I still haven't so much as gotten a clear look at it; I just know it's a bobcat because it was brown, it climbed a tree and didn't seem to have a tail. I'm sure I'm pant-hooting at this point, trying to motivate my body through the studio maze of prints and matboard and furniture to get it as fast as possible down the basement stairs and to the sliding glass doors of downstairs bedroom, where I am praying in rapid-fire heathen gibberish that it will still be visible. It's a small, scant hope, that the cat will have paused to catch its breath, but that small hope is so big it is bursting my heart. And it has paused. It is standing about eight feet from the patio door. I shoot wildly through the heavy black screen and two layers of glass. It is here. 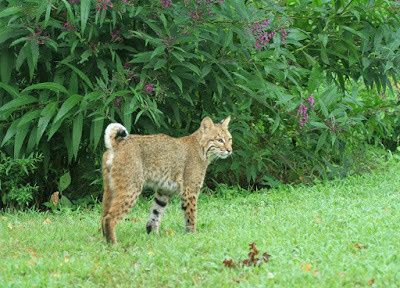 It is a young male. And it is so, so beautiful. I have come down here quickly enough to capture his look of disappointment as he thinks about the squirrel he might have been eating, had he not flubbed the chase. I guess that he might be a yearling. 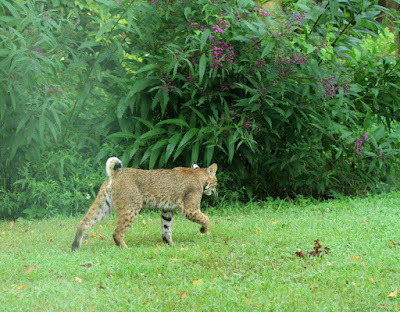 I don't think this year's kitten would be so big yet, or hunting on his own. I keep shooting. I wish I weren't shooting through screen and glass, but this is far better than any bobcat photo I've ever taken, because I've taken none. This is my Most Wanted Ohio Animal. In my back yard. And I have my big camera on him. He seems to get a notion, and trots toward the greenhouse, then reverses his course and heads for the orchard. I quickly sashay left and can now shoot through the glass door from behind a curtain, unobstructed by screening. Ohhhh yeah. I love the way he keeps his tail curled up over his back. Still excited from the chase? Planning to spray a bit? Don't know. Just charmed. I will him to stop for more photos. He does. I get overexcited and start punching the shutter again. I am so, so excited. 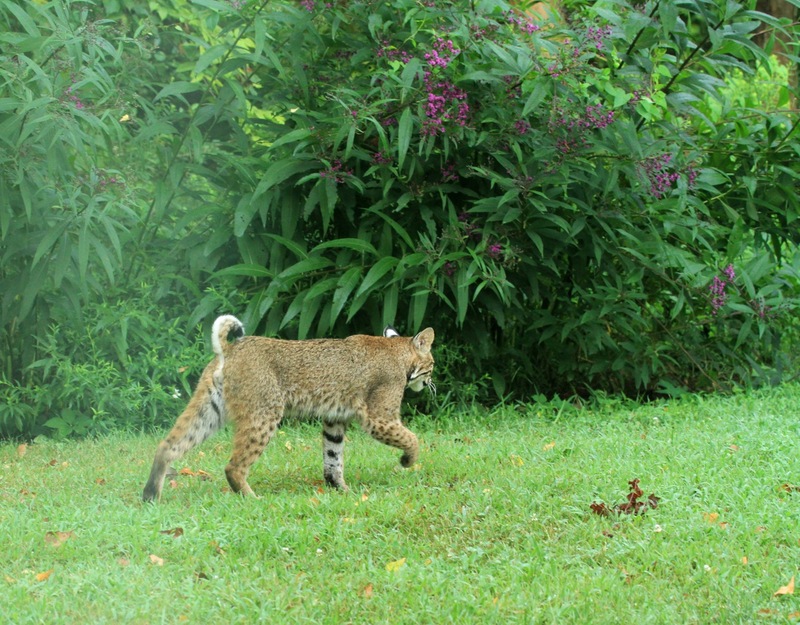 There is a bobcat in my backyard!!!!! BREATHE. BREATHE. Squeeze the shutter button. Don't punch it. You got this, Zick. You're going to need to click on this one to embiggen it, folks. 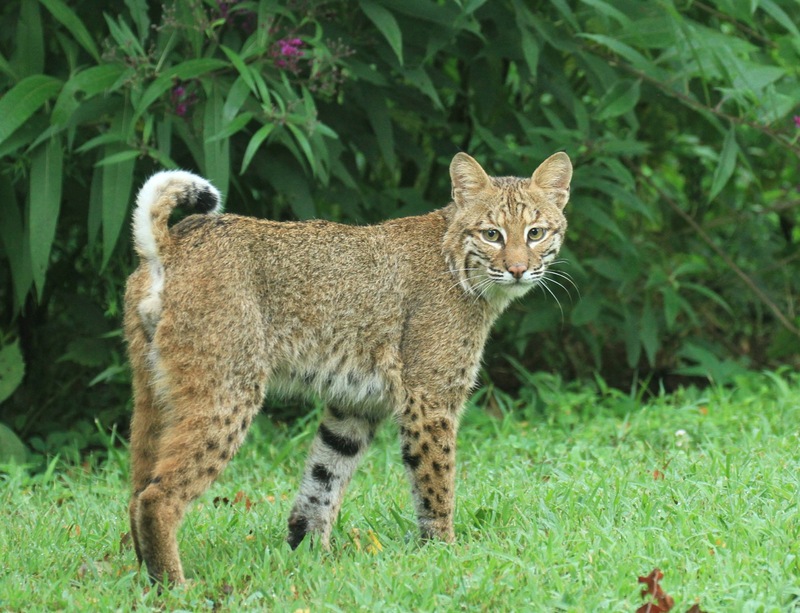 Let your eye travel over every inch of that exquisite piece of wilderness, that puzzle piece of Ohio's fauna that has been missing until less than 15 years ago when our pitched efforts to extirpate bobcats finally trailed off into futility. 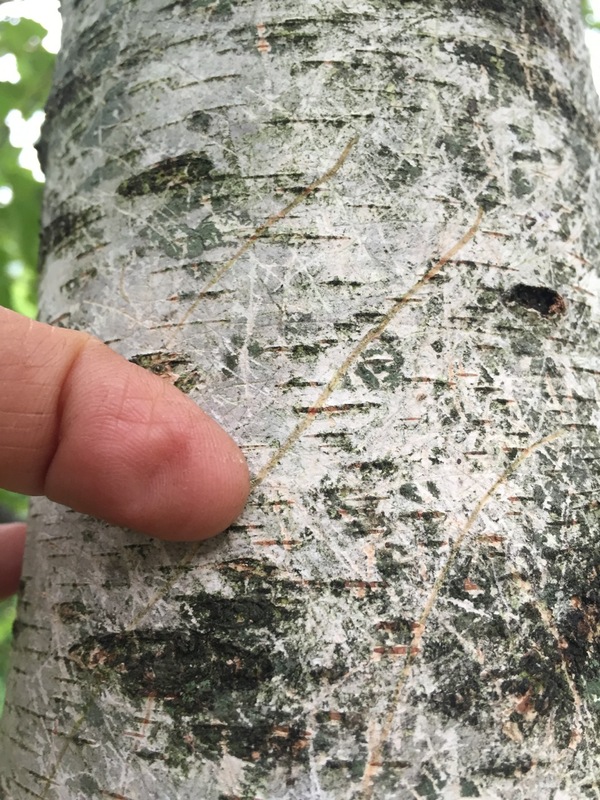 When reforestation and their modest reproductive potential finally caught up with the heinous leg-hold trapping and persecution and habitat loss we have visited upon them since we first set ugly foot into their beautiful world. Look into those greengold eyes, those eyes that say "I see you. And I am not afraid. Thank you for the fat squirrels and mourning doves you supply me. You've got too many of them here. I'll take care of that." 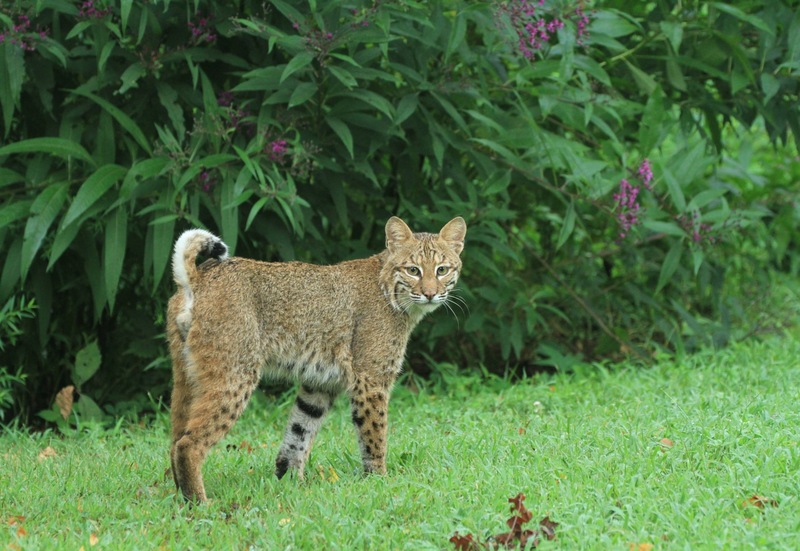 I know that, as long as I live, I will likely never take a better photo of a bobcat, in perfect health, in perfect light, with the Ironweed Festival going on behind him. And for that I will be grateful forever. He turned to go, giving me a flash of his fabulous pied earbacks. Soft padded pink paw pads. Jungle spots and bars. Tail still saucily curled over his back. Gotta love this cat! I'm calling him James, for my feisty, fiery friend in Honduras. It just fits. I kept shooting as he calmly walked away. I had to drink this sweet cat in, every inch of him, while I had him in my sights. As he turned, and I looked at his slab sides, it hit me that he really is still a kitten. A really big, really fierce kitten. Please come back as often as you wish, grow big and strong and smart, and help yourself to my squirrels. Thank you for your efforts. Tomorrow at 7:33, again? I'll be watching! 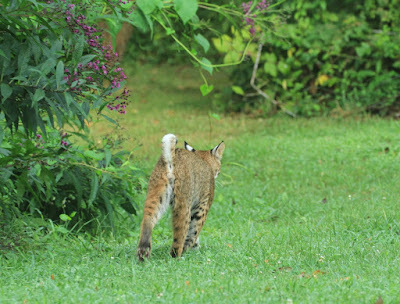 As he disappeared, bunnylike, into the ironweed, I remembered the bobkitten I'd tried to help in the summer of 2014.
and how my heart had broken clean in two when he was taken away to a purely lousy fate. And I smiled. Because in a very real and beautiful way, Bobkit was back. Here, big as life. 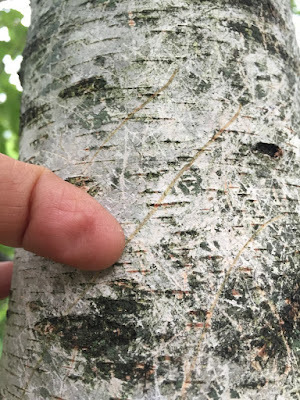 Leaving scratches on my birch tree, scratches from great big claws on toes that are very far apart. Yes, this is the Best Thing I've Seen in My Yard. Ever. 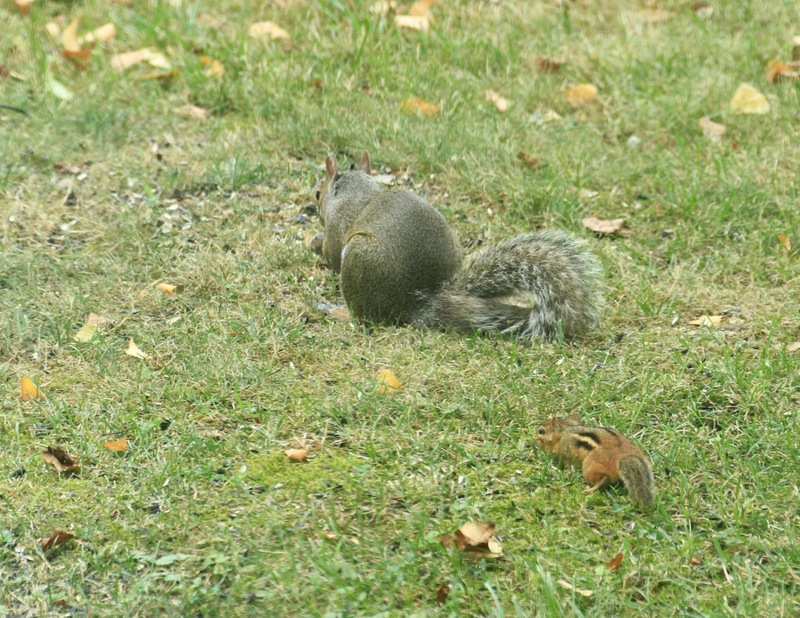 The squirrels squir-squir-squirrrred for about an hour after the attempted murder, which made me laugh out loud. I laughed again when this squirrel climbed all the way down a little tree until it bent over, before he got the nerve to come to the ground for seed again. You should be afraid, you little rascals. You should worry when you come into my yard. James is on the prowl! There will finally be a price on your fat little bottoms! While you're at it, James, take a chipmunk hors d'ouvres. Please. Could not be happier for you. And him! Fantastic! Thank you for sharing the pictures AND the thrill! A gorgeous critter. A wonderful telling of the tail. Pun intended. Purely wonderful! Thank you, thank you! Can't remember ever enjoying any blog more, ever! This is wonderful news!!!!! 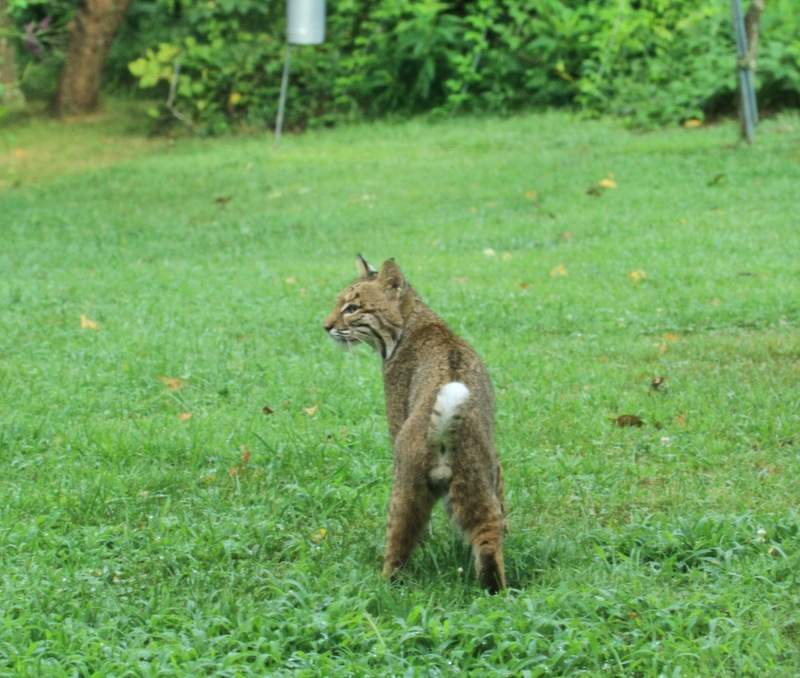 Congrats on your "life yard animal!" Wow, wow, WOW!!!!!! Oh, my breath stopped when I scrolled down to the first photo, and I thought, "She got one!" When I kept scrolling, I was standing there with you, in that Depends moment of awe and fast heartbeat! Wow, Julie! Just, WOW! Amazeballs!!! 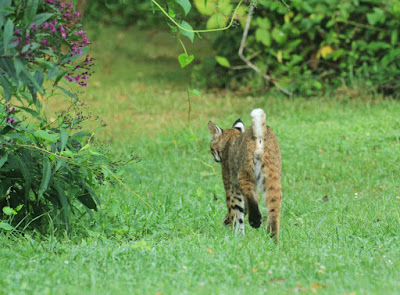 Our bobcat came at dusk and was grown. He had black bars on the back of his ears, which I only saw when I transferred my card to my computer and blew up the photo. You definitely had great light. How wonderful! So SO cool! Thanks for sharing! Here's to James, and all like him. Oh he's a beauty! Confident and sleek. Great shots, so much better than what our trail cam captured with the cougar and lynx a few weeks ago, but giving thanks for all the wonderful wildness still out there. I believe firmly in the Law of Attraction, and it certainly explains why you keep having these beautiful experiences. You show gratitude and wonder for all the beauty, and that attracts more beauty to it. I have an online acquaintance who constantly complains about the miserable things that are happening in her life. And guess what? More miserable experiences follow close on their heels. In any case, I LOVE these posts, and they give me a shot of happiness with which to start my day. I am grateful to you for that. Wow! That guy is amazing and beautiful! Simply AWESOME! An exquisite creature for sure. Congratulations on such a lucky moment and for showing just how valuable those runty fluffy-tailed squirrels can be after all! The world. You just gave us a mystical glimpse of the best of this jaw dropping beautifully exquisite world. You just gave us what we are starving for...and what our souls deserve to feel. I did actually squeal aloud. Spectacular. And to get the portrait of all portraits against ironweed? I'm a big believer that magic is there for all to see; just so long as one is looking. I see a lot of magic, but unfortunately I'm a rather subpar photographer. So I often have to paint the picture with my words and hope people believe me! Congratulations, this is just excellent. Congrats on your garden coup. What a portrait. So exciting!! Jombah! Dem cat gonna git dat little dog. I'm coming to live with you. ;-) That was an exquisite piece of writing, Julie. You brought tears to my eyes. Thanks so much for sharing. "skibble" I just love your wordsmithing. Wonderful creature to have as a yard creature. In his younger years Bacon would take care of those squirrels, now he has an assistant. Delightful post Julie, well worth to wait. Probably die on spot!! Spotted in Crown City area south of G!! Every time I read you I wish I was your neighbor. The beauty that you see and appreciate fills my heart. You are a talented, loving human and your blog lifts me up every single time. Thank you for this and more. I laughed out loud when he looked right at you. What a hoot. What a gas. I am so envious that you got photos. 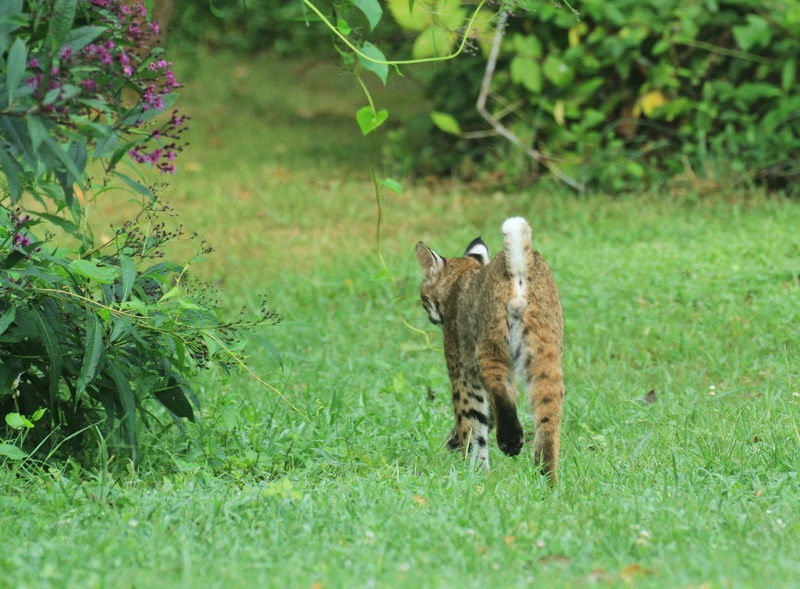 There are lots of the critters around here but we hear them way more often than we see them. However, once one did exactly what yours did - chased a squirrel up a tree that was just outside our picture window. It realized we were there, stared at us for a second or so, then ran off into the pasture and woods. It was breathtaking. Icing on the cake, it happened on my husband's birthday in November. Best present ever! Color me jealous! I'm like you, I'd have been just as excited and flabbergasted as you! My bobcat glimpses have been flashes--was that...yes, yes it was!--type moments. Photos...psshaw! Stellar luck! I hope James returns for some squirrel-y delight! I agree with mimimanderly. And now you know how Bobkit would have looked in your yard. I bet the squirrels are packing their bags today. Hi Julie. Don't know why exactly, but this moved me to tears. What a beautiful beautiful young critter! And such great shots you got of his wild magnificence! oh my gosh my heart was pounding as I read this! How incredibly exciting, what gorgeous shots and so glad there's a little redemption for the sad fate of Bobkit. wow great pics and I really believe ...as I do for myself with the beauty here in my mountains every day - that the reason it is there for you in all its' glory is that you are so grateful for it and mainly the type of person who is all ears and eyes in anticipation of what you will wake up and see. Your heart is wide open to nature so nature is wide open to you. Congratulations! You were ready. The real world is always there, you just have to be ready. Magical! What a gorgeous boy! Fantastic!!! Loved this...love you for sharing it! WOW! Those pictures are so incredible, as is your narrative. I can feel your excitement as you search for equipment, race around your house and then... you got THOSE shots! Hope James returns soon! You had me right there with you. Thank you for that, and for being so ready for these moments. Wow! 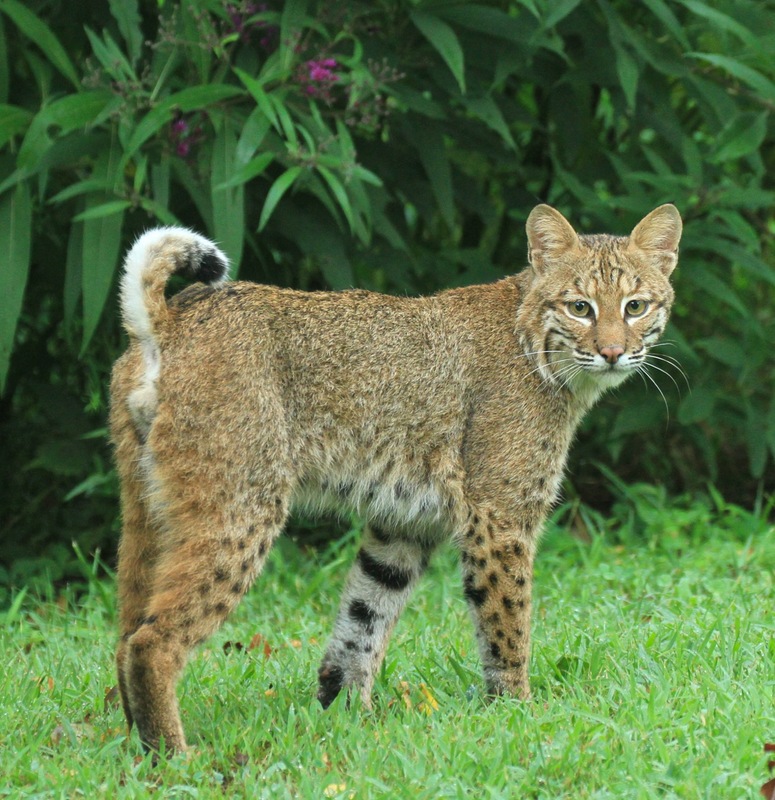 Love seeing that stunning bobcat. Such a beautiful creature. I'm so glad you had such a fine opportunity to cross paths with this fella. I know you know how I feel about bobcats. It's been four years since I've seen one, and these photos make up for that big time! Amazing photo of a beautiful being. Thank you so much for sharing and I hope he visits again, sometime soon! That's not luck. That is the result of open eyes and an open heart. This might be my favorite blogpost in the 9 years of following you. 9 YEARS, how did that happen! The photos, the moment, the serendipity, the writing - BLOW ME AWAY. Almost as much as that we have been friends for 9 years. Hopefully anonymous will let me get around the google police. Love, your timmy in brazil. Wow!!! AMAZING JULIE!!! Great shots. Domestic cats/wild cats. I saw hummingbirds, yellow warblers, house finches, cardinals, blue jays, titmouse, chickadees, mockingbirds.. no bobcats here in Lower Al. Not on my four acres anyway. A fabulous post! You give me hope and a new vision of SE Ohio. Thank you, Thank you! WOW. I felt like I was seeing it right along with you. I felt my heart rate speed up while I was reading each word and I'm laughing because I would have probably done the same commentary, taking to myself out loud to calm down, "you got this". LOL. Congratulations on the BEST yard animal ever!! What a hunk of a cat! Wish he had gotten that squirrel--or a couple! From one cat lover to another! Cathy in CO! OMG - that is the BEST yard critter ever! Magnificent! Just spectacularly beautiful! My heart would've been in my throat the whole time -- how did you breathe!?! Great pics, thanks for sharing.